One of the most impressive dolls in the range of Everything's Rosie toys produced by Vivid Imaginations is the charming Ring 'o' Rosie doll. This popular children's nursery rhyme takes on a whole new meaning when Rosie sings it! Join in the fun by holding hands with her and singing along. As soon as you let go though, the fun stops! Dressed in her favourite outfit, this Rosie doll looks just like the star of the show! Created by V&S Entertainment and described as a "preschool sensation", Everything's Rosie is a huge hit for CBeebies with excellent viewing figures and a fast-growing army of young fans that are eager of get hold of Everything's Rosie dolls. 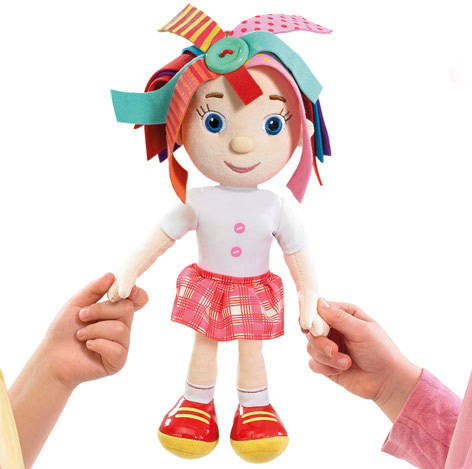 Please tell us what you think of Ring 'o' Rosie Doll by Everything's Rosie.